On a hot summer day in the not-too-distant past, I made a small contribution to a Kickstarter project for a film known as “Science Moms.” As time went by, the pressures of daily life pushed the movie to the back of mind, along with that promise to my wife to mow the lawn, and something about an engagement party we were supposed to attend on Saturday. Regarding the film at least, my memory was jogged last weekend, when directors Natalie Newell and Brian Newell saw to it that a copy showed up in the inboxes of the documentary’s supporters. I was delighted. Science Moms1 is thirty minutes of entertainment and science wrapped around a hard hitting message: celebrity-driven misinformation on issues such as vaccines and GMOs is making life miserable for parents, who don’t know where to turn for advice–and often end up making costly decisions. The movie is loaded with witty animations, facts that hit home but don’t overwhelm, and, my favorite, touching personal stories from each mother. The most poignant moment for me was the story of a neuroscientist who reflected that views of the polio vaccine are so different now than they were in her own mother’s time. This echoes my own mother’s recollections of losing grade school friends to the dreaded disease, and her nightly prayers that she wouldn’t end up in an iron lung herself. The polio vaccine was/is a Godsend, yet we live in an age where parents are frightened away from safe vaccines by Hollywood stars whose science education is, to be kind, lacking. Such are the lessons of this wonderful documentary. I doubt that Science Moms will change the minds of any of the virulent anti-vaccine, anti-GMO, anti-science crowd, but I don’t believe that’s the film’s target audience. The Science Moms are speaking to other mothers out there who are just as confused and frightened by misinformation as they once were. I’ve always likened good science communication to vaccines: once someone like Gary Ruskin or Carey Gilam (USRTK) has been infected by anti-GMO propaganda, or Andrew Wakefield’s shameful vaccine lies, there’s probably no chance of saving them. But there are countless parents who have yet to be infected by the diseased words of the Sarah Michelle Gellars, the Jenny McCarthys, and the Gwyneth Paltrows of this world. Science Moms is the ideal vaccine for these parents. To be forewarned is to be forearmed. Information antibodies introduced into the brain by this $4.99 (downloadable) film could be just the thing to save a confused mother (or father) who comes up against the dangerous, pseudoscientific nonsense of a Vani Hari or David Avocado Wolfe sales pitch. Science Moms logo copyright (c) 2017 Natalie Newell and Brian Newell/ScienceMoms. Used in accordance with Title 17 U.S.C. Section 107, commonly known as “fair use law,” distributed without profit, for the purpose of review, education, and increasing public knowledge. Baby in sink copyright © 2017 Miranda Lynn White, all rights reserved. Used with permission. Remote control image by Santeri Viinamäki, used under Creative Commons Attribution-Share Alike 4.0 International license. Dr. Armand Dorian gets my vote for Man of the Year for calling out “Dr.” Jack Wolfson over his unscientific positions on vaccines and the current measles outbreak in California and 13 other states. I’ve linked the video below. Even though CNN sneaks in a 30 second commercial at the beginning, it’s well worth sitting through just to hear Dorian deliver the truth: it’s hard to believe that Wolfson has a medical license. The man is literally doing harm to his patients. Dorian and Wolfson debate. Click to launch video. (1) We’re injecting chemicals in our children’s bodies (when we vaccinate). Well, duh. Our bodies are made up of chemicals. Everything we eat and drink is a chemical. Everything we see, touch, taste, and feel is a chemical. Dr. Wolfson, here’s a beautiful online version of the periodic table of the elements.2 You should have studied this in grade school. Chemicals! Oh my God, they’re everywhere! According to the CDC, measles is the leading cause of vaccine-preventable death in children.3 Doctors agree that’s a really good reason to inject those chemicals. They’re saving lives. Death is not a benign condition. The CDC says for every 1000 children who get measles, 1 or 2 will die.4 One out of every four who contract the disease will be hospitalized. There is no cure for measles. Getting the vaccine is safer than coming down with the disease. Measles can lead to swelling of the brain and severe respiratory problems.5 And, oh yeah… did I mention death? The “right” to get infections? Sometimes you encounter a statement that’s so utterly stupid there’s just no response. I suppose our children have the right to die in car crashes, but I’d like to prevent that. Yes doctor. And that’s why we wear seat belts. There’s some good science behind the seat belt concept, just as there is behind the measles vaccine. Before the vaccine was invented in the 1960s, there were up to four million cases of the disease in the USA each year, with an average of 48,000 hospitalizations.5 Thanks to the vaccine, measles was eliminated in this country by the year 2000.6 Now, thanks to anti-vaccination campaigns and quack doctors, measles is making a comeback. Chiropractors are not doctors. They have no medical training. There’s nothing about chiropractic training or care that remotely begins to address handling a virus, which is what causes the measles. For this statement alone, I agree with Dorian: Wolfson should not be practicing medicine. He’s violating the Hippocratic oath. CNN screen snapshot is used in accordance with Title 17 U.S.C. Section 107, commonly known as “fair use law”. This material is distributed without profit with the intent to provide commentary, review, education, parody, and increase public health knowledge. (6) CDC: Frequently Asked Questions about Measles in the U.S.
That’s right. No active ingredients. Read on to see if Oscillococcinum might be right for you! Oscillococcinum was a drug originally made from the non-existent oscillococcinum bacterium (wink wink nudge nudge) and marketed as a cure for the flu. This is curious, as the flu is viral, not bacterial, in nature. Now made from duck parts that don’t exist — perfect for a quack cure — Oscillococcinum is homeopathic. One of the features of many homeopathic medicines is that they are repeatedly diluted during production. 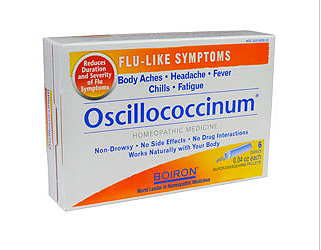 Oscillococcinum is typical: the dilution is so extreme that there’s no original product left in the box when it goes out the door. As is the case with any homeopathic medicine diluted to such extremes, the odds of receiving any end product (in this case, duck) are so astronomical they border on impossible. But would you actually want the duck? Wait. What’s happening here? Is CVS selling me an infected bird? That’s freaky scary. 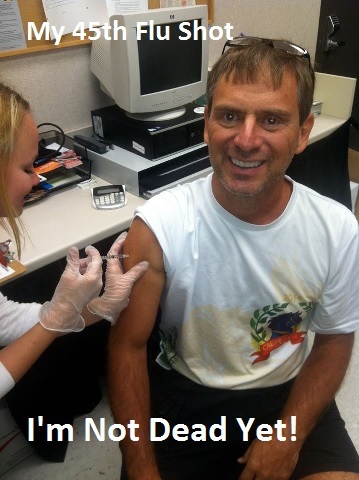 When I get the flu shot, at least I know the virus in the shot is dead. 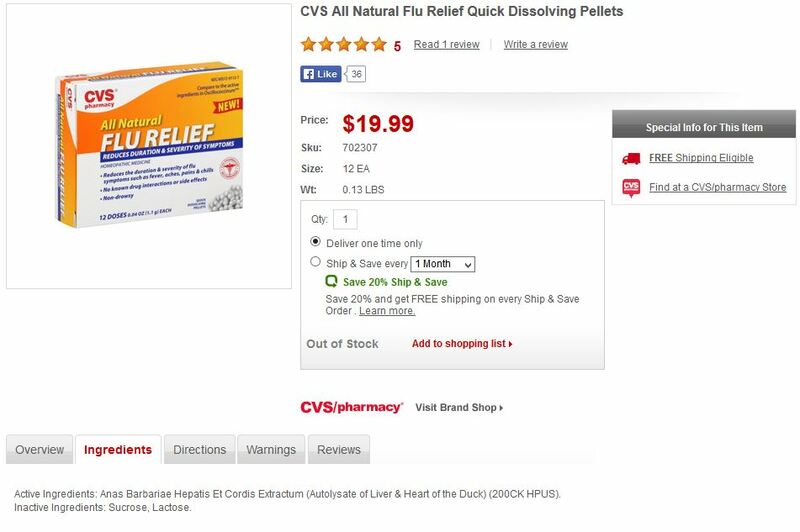 The imaginary active ingredient has been completely removed from this product, and CVS doesn’t even try to hide it: they brag about it! The Frenchman tested a vaccine he developed on his cancer patients who, of course, died. Afraid of being infected by his patients, the doctor went in search of his oscilloccinum bacterium in the wild. He claims to have found it in a duck. I’m not making this [expletive deleted] up. No one else has ever seen oscilloccinum. It doesn’t really exist. But this hasn’t stopped snake… erm… duck oil salesmen from cashing in. Manufactured by the French company Boiron, Oscillococcinum has been singled out for deceptive marketing in the United States. In June 2010, Homeopathy for Health, a Washington vendor, was cited by the FDA for a slew of violations, including marketing Oscillococcinum as a treatment for H1N1 (“Swine Flu”) and “relief of flu symptoms”.3 Although the CVS literature lists one late 1980s study with marginal results touting Oscillococcinum efficacy,2 no other studies back the CVS claims. This is not surprising. If you only have one study to back you up, take that study, trumpet it loudly, and hope nobody notices. When sugar pills are shown to stop the flu virus, let’s all meet in the bakery aisle of the supermarket when we get sick, and skip the trip to the doctor. CVS places homeopathic medicines next to real medicines on their shelves (with similar packaging) with no consumer warnings, making it difficult for a trusting public to know what they’re buying. When a pharmacy dispenses real medicine and real flu vaccines along with sugar pills without any cautionary text, it’s a problem. Skipping real treatment in favor of Oscillococcinum could do real harm. 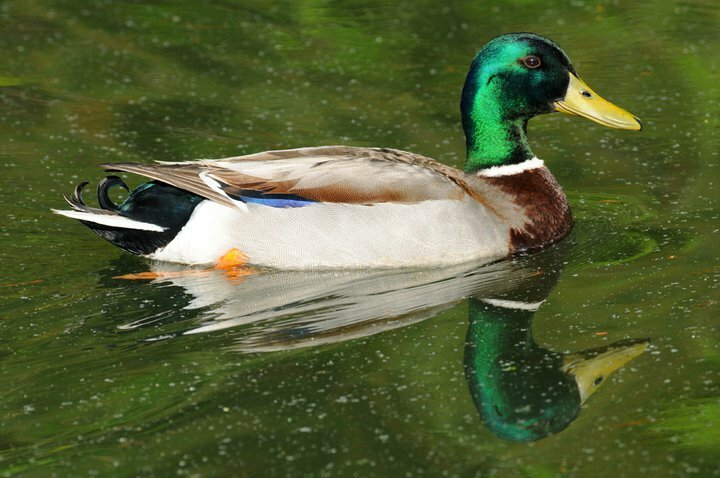 A “drug” made from sugar and non-existent duck parts? A company that takes pride in its public health outreach programs4 should be ashamed of itself for this quackery — no pun intended. I hope readers will take a moment to go the CVS Facebook page7 and express their unhappiness. As consumers, we deserve better. Postscript (18 December 2014) Alert readers have pointed out that CVS is not the only vendor selling this fake medicine. Indeed, since writing this article, I’ve found it online at Amazon and Drugstore.com. It’s reportedly been seen on the shelves of Walmart, Walgreens, and Rite-Aid–though I haven’t witnessed that myself. I’ll be writing follow-up articles to cover this. No matter where you find it–if you find it–please encourage sellers of oscillococcinum to remove this useless product from their shelves. CVS Oscillococcinum product image used in accordance with Title 17 U.S.C. Section 107, commonly known as “fair use law”. This material is distributed without profit with the intent to provide commentary, review, education, parody, and increase public health knowledge. Duck image by the author. Copyright (c) 2014 Mark Aaron Alsip. All rights reserved. I’m glad she published this article, because it touches on two major topics that come up in nearly every anti-vaccine argument: aluminum in vaccines and flu vaccinations for pregnant women. An important disclaimer here: I’m not a doctor. Even though I did stay at a Holiday Inn Express last night,9, 10 your ultimate source for medical information should always be a qualified doctor, not something you read on the internet. I’m here to point out what real doctors and scientists are saying about the nonsense anti-vaccine proponents are spouting. You’re a smart person. Please do the research. The outcomes are important. Right away, the original article sways from truth and science like Justin Bieber’s car during one of his drunk driving sprees15. Not only does MAMA lie about which vaccines include aluminum, she doesn’t understand that it’s safe. If you disregard the specific Haemophilus influenzae type b vaccine, flu vaccines do not contain aluminum.2, 11, 12 You also won’t find aluminum in other vaccines commonly claimed to be “toxic” by anti-vaxxers, such as those for polio, MMR, or shingles. Oops. But, is aluminum a danger in the vaccines (such as hepatitis A & B) that contain it? No. So, you can’t avoid aluminum unless you give up eating, drinking, and breathing. But there’s no need to worry: your body can (and does) handle the aluminum safely. There is no aluminum in the common flu shot.2, 11, 12 For other shots that contain aluminum (for example, hepatitis A & B), the amount of aluminum is insignificant compared to what we obtain from eating, drinking, and breathing. But your body doesn’t care where the aluminum comes from: it removes it the anti-vaxxer’s favorite way — naturally. There’s one important warning: According to the CDC, pregnant women should not receive the live version of the vaccine (the nasal spray), but the inactivated version (the shot) is harmless.7, 18, 19 Although we’re specifically talking about pregnant women here, this warning about the live version of the vaccine also applies to certain other groups such as immunosuppressed persons.32 When in doubt, always talk to your doctor. It’s interesting to pause here and consider the hypocrisy of MAMA. Later in her article, she’ll tout the amazing benefits of essential oils in combating viruses, even though their safety for use during pregnancy has never been studied. MAMA begins by misquoting a real scientific study6, which looked at the effects of essential oils (EO) on bacteria. The problem is that the flu isn’t caused by bacteria. It’s caused by a virus. There’s a huge difference. Bacteria are single-celled living organisms; viruses are small packages of DNA or RNA that cannot “live” without being injected into a living cell. So we’re off to a bad start already, with an article using research performed on bacteria to support a conclusion about viruses. Interestingly, it turns out that chemicals found in essential oils are being studied for anti-viral properties, and are showing promise — in test tubes.22, 23 MAMA doesn’t cite any of these studies, for obvious reasons. No doubt, if the research results in a promising medicine that works when ingested, anti-vaxxers will dismiss it as a Big Pharma conspiracy. There are many essential oils known for being antiviral. Tea tree (melaleuca), basil, lemon, peppermint, and more. All these oils will enter your body, enter your cells, and fight off viruses that have already taken over your cells. It’s pretty amazing. What would be even more amazing would be even a single reference to back up this claim! A University of Minnesota (UoM) article30 warns that while many essential oils are safe when used on the skin, some can cause serious harm — including liver and other organ damage — when ingested. The same article warns that some EOs are not safe to apply to the skin, or should not be applied to the skin without dilution, else photo-toxicity can result. UoM reminds the reader that peppermint oil is heavily laced with methanol-one, which has caused young children to stop breathing. The flu is dangerous. In 2010, influenza and pneumonia (which go hand-in-hand) killed over 53,000 people in the United States.27 Except for the Haemophilus influenzae type b vaccine, flu vaccines do not contain aluminum, but aluminum is unavoidable in our diets, and our bodies process it naturally. Other vaccines that contain aluminum contain far lower amounts than the water we drink or the food we eat, and are safe. The live (nasal) form of the flu vaccine is not recommended for pregnant women, but the dead (injected) form has been given to millions of pregnant women and medical studies conclude that it is safe. Finally, although scientific research is being done on the possible benefits of chemicals extracted from essential oils, the article being debunked presents no evidence of any trials in humans — because, as of this writing, there aren’t any. In fact, some essential oils are known to be toxic when ingested by animals. (30) Are Essential Oils Safe? 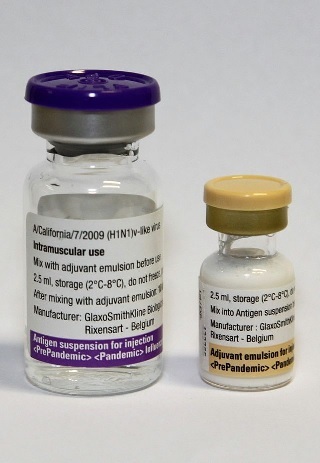 Pandermix flu vaccine from WikiMedia Commons, released into public domain with no restrictions. Pregnant woman by Inferis, from WikiMedia Commons, used under Creative Commons Attribution-Share Alike 2.0 Generic license. Image owner does not necessarily share or endorse the views put forth by the author of this article. Aluminum by Romary, from WikiMedia Commons, used under GNU Free Documentation License. Image owner does not necessarily share or endorse the views put forth by the author of this article. Essential Oil from WikiMedia Commons, released into public domain with no restrictions. Which is Safer: Vaccines or Illnesses? An internet alternative medicine fringe web site, Modern Alternative Mama (MAMA), has begun promoting “Vaccine Injury Awareness Month” in conjunction with (an announced) dangerous campaign to hawk natural cures for cancer, in scientific mockery of Breast Cancer Awareness Month. How Dangerous are these Diseases? Before 1985, Haemophilus Influenzae type b (Hib) caused serious infections in 20,000 children each year. In 2002, there were 34 cases. In the 1964-65 rubella epidemic, 12.5 million people were infected. Of the 20,000 babies born with rubella, 11,600 were deaf, 3,580 were blind, and 1,800 were mentally retarded. There were only 4 cases of congenital rubella between 2001 and 2004. In 1952, polio paralyzed more than 21,000 people. In 2002, the United States was polio-free. In the 1920s up to 200,000 cases of diphtheria were reported each year, killing up to 3,000 annually. In 2002, the number of cases in the USA: one. Prior to 1963, measles killed more than more than 500 people per year out of an infected total of more than 3 million/year. In 2002, there were 44 cases of measles nationwide. (Recently, when vaccination rates dropped due to anti-vaxxers, serious outbreaks of the disease occurred in unvaccinated persons in states such as California and Ohio. Ohio alone exceeded the entire 2002 nationwide total). In the 1940s, whooping cough killed up to 8,000 children per year, infecting an average of 175,000 per year. In 2002, only 771 cases were reported. No MAMA. The people more likely to get any of these preventable diseases are the people who have not been vaccinated. Look at the statistics. How Dangerous are These Vaccines? Unfortunately, in science, what one person believes or doesn’t believe doesn’t matter. “I don’t believe it” and conspiracy theories figure heavily into MAMA’s work. MAMA isn’t a bit shy about listing “death” as a possible side effect of the MMR vaccine (which has never been proven6), but that doesn’t stop her from accusing the CDC of fear-mongering. Not to mention openly lying in saying that the CDC statement concludes that hearing loss is likely. What MAMA doesn’t tell you is the most important thing about VAERS: anyone can file a VAERS report. No cause-effect relationship between a vaccination and the reported problem is ever established. For example, I can get the MMR (measles, mumps, rubella) vaccination tomorrow, get food poisoning at lunch from a bad burrito, and report the resulting vomiting and diarrhea to VAERS as a reaction to the vaccine, and into the database it goes. 7 This disclaimer is in the first paragraph of the VAERS database description. Yes MAMA, please… no scary tales. If you’re going to quote from the VAERS database, understand what it is first. Really. Please. Are There Any Benefits to These Diseases? I’ll leave that up to the reader. Are blindness, deafness, paralyzation, mental retardation, and death beneficial? Perhaps the most offensive part of the the MAMA article deals with Africa. Eight poorly vaccinated countries. No wonder MAMA wants to dismiss Africa. … and, of course, children in “first world” countries such as the USA are being vaccinated… unless MAMA gets her way. Why oh why would you rely on statistics from a source you don’t believe is accurate? And why oh why would you write a supposedly science-based article and lace it with statements about your beliefs, and your assumptions, rather than hard numbers? Because when you assume, and base your pseudoscience on personal beliefs, you can make anything seem true. (Please note: to avoid increasing search engine positioning for dubious, quack web sites, I use the excellent DoNotLink.com redirect service for hyperlinks to these sites). (2) Vaccine Effectiveness: Do vaccines work? Let’s concentrate on the highlighted portion: If you are a nurse or other health care provider in direct contact with patients, not only is it your employer’s right to know which medical diagnoses and/or vaccinations you’ve had, it is the patient’s right to know. You see, like bad advice, diseases can be passed along from person to person. In the case of a medical provider who comes into contact with a lot of infectious disease, the odds of passing along the disease increases– much in the same way the odds of receiving bad advice increase for those coming into more frequent contact with the bad advice found in the Nurses Against Bad Vaccines forum. Perhaps the nurse who wrote this gem of a post has never heard of contagious diseases such as Ebola. If I’m a patient and my nurse has Ebola, he is carrying with him a near-certain death sentence (1) — a highly contagious death-sentence during certain stages of the disease. Certain death for him; very likely certain death for me. I don’t have a right to know? Really? If my medical care provider has been diagnosed with an infectious disease, I have a right to know his/her medical condition. Going back to the Isaac Asimov quote: the nurse may feel that he/she has a democratic right to keep this information secret. However, not realizing the danger he/she poses to me is scientific ignorance on the nurse’s part, and it does not trump the patient’s scientific knowledge. Come to think of it, it doesn’t trump the patient’s rights either. But What if the Nurse Isn’t Infected Yet? What the author of this Nurses Against Mandatory Vaccines post is really campaigning against is getting vaccinated and/or making their vaccination status known. Do I as a patient have a right to know if my nurse has been vaccinated, and/or demand removal from the doctor’s office of nurses who haven’t? Pseudoscience groups have yet to come up with a shred of evidence that any vaccine I’ve mentioned here is dangerous, while study after study has shown that vaccinations are key to preventing the spread of these diseases. I’ve blogged on this twice with exhaustive lists of references (5) (6). If my nurse has not been vaccinated against infectious diseases, I have a right to know. Because of herd immunity (7) and the fact that no vaccine provides a 100% guarantee, it’s especially important that an unvaccinated health care provider doesn’t come anywhere near myself or a loved one. To be blunt, I have a right to know if my nurse is a potential Typhoid Mary (8). Health care workers are exposed to more potential virus carriers than you or I. That’s a fact of life in the hospital or doctor’s office. There’s a reason that experts recommended that the first people to receive the first Ebola vaccines be healthcare providers (9) — not only were they most at risk — they were the most likely to become breeding grounds for the virus and pass it on to other people. Because a health care worker’s first priority is the care of the patient, and vaccines do not place the health care worker at risk, patients have a right to know if their health care provider is an unvaccinated breeding ground for a highly infectious disease. But is there a legal precedent for this? Are there any other professions where both the employer and the consumer have a legal expectation to know the health status of the employee? Well, yes. As a matter of fact, there is. Have you ever flown on a commercial airliner? The health requirements for airline pilots are quite strict (10). When an anti-vaccine nurse steps onto her flight from Dallas to Miami, she knows for a fact that the pilot in the cockpit is certifiably free of nearly two dozen serious medical conditions (11). Why? Because the health and safety of others are directly affected by the pilot. If the pilot has a problem in flight, it very quickly becomes a problem for every passenger on the plane. Sounds a lot like vaccinations, doesn’t it? Any anti-vaccine nurses out there willing to fly on a Delta Airlines flight piloted by a woman suffering from angina pectoris, epilepsy, or substance abuse? I didn’t think so. So, no, a person whose work directly involves the safety of others does not have a right to expectation of privacy concerning health matters that would adversely and directly affect others, and/or engage in health behavior that would adversely and directly affect others. Nurses, get your vaccinations. In an upcoming article, I’ll be taking down some specific, dangerously false information being put out by anti-vaccine groups, including the hilarious claim that your best defense against the Shingles infection is repeated exposure to/infection by Chickenpox. Until then, I’ll leave you with a photo of myself getting the 45th flu shot of my life, and encourage you to talk to your doctor and get one for yourself and your children as well.